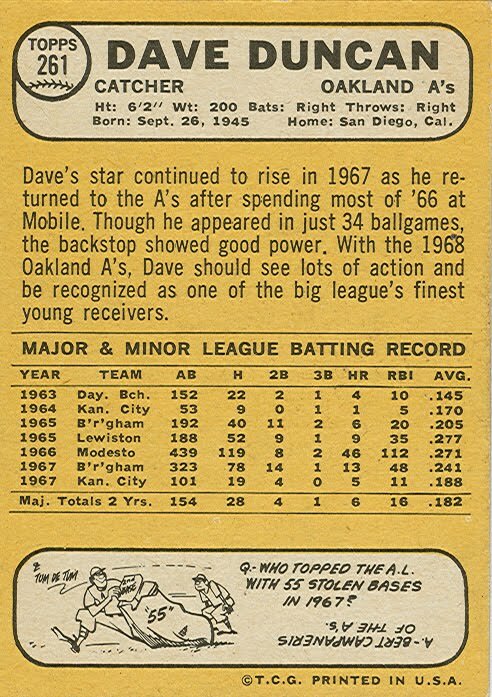 Dave Duncan (#261) had his first baseball card in 1964 as half of an Athletics Rookie Stars card. He only played 25 games in 1964, then returned to the minors until resurfacing in 1967 for 34 games. Because of this, he was excluded from the 1965-67 sets. He would have a card every year from 1968 to 1977. Duncan was signed by the Kansas City Athletics in 1963. After only one season in class-A ball, he spent the entire 1964 season with Kansas City (but only appeared in 25 games). 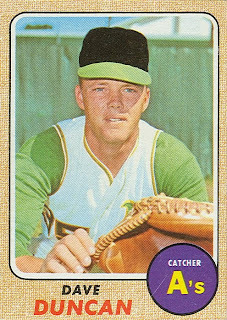 From 1965 to 1967, he played class A and AA baseball, and also appeared in some games for the Athletics in 1967, backing up #1 catcher Phil Roof. 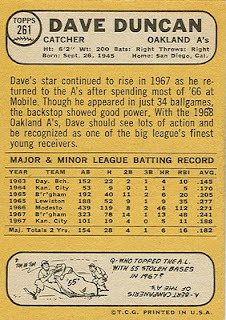 Dave's only season in triple-A came in 1968, when he split his time between Vancouver and the (now Oakland) Athletics. Duncan split the starting catching duties with the newly-acquired Jim Pagliaroni in 1968. In 1969, Roof was back in the starter's chair, with Duncan and Larry Haney manning the 2nd and 3rd string catchers jobs. The following season, Dave again split the starting catching assignments, this time with Frank Fernandez. However, rookie Gene Tenace arrived on the scene, catching about 20% of the games. 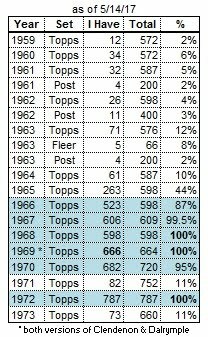 1971 and 1972 were Duncan's only seasons as the Athletics' clear-cut starting catcher (with Tenace in reserve). The latter part of Dave's career was spent bouncing from team to team. Before the 1973 season he was traded to the Indians for catcher Ray Fosse. In February 1975, he moved on to the Orioles for 1st baseman Boog Powell. After the 1976 season, the Orioles traded him to the White Sox for outfielder Pat Kelly, but Duncan was released in spring training. Dave went on to have a long (and still active) career as a pitching coach for Tony LaRussa in Oakland and St. Louis. I wonder if any other non-pitcher was ever a major-league pitching coach? 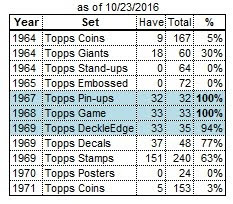 Notice on the back of the card that it says he spent "most of '66 at Mobile" which would have been a heck of a daily drive from Modesto. And to still hit 46 HR while doing it! It's not a missprint - Baseball-Reference.com has him down for 46 home runs also. That was his 4th professional season (after spending his 1st 3 seasons in class A, the majors, and then A & AA). I wonder why he was even playing A-ball that year? Rube Walker, a former catcher, was the Mets' pitching coach for many years.